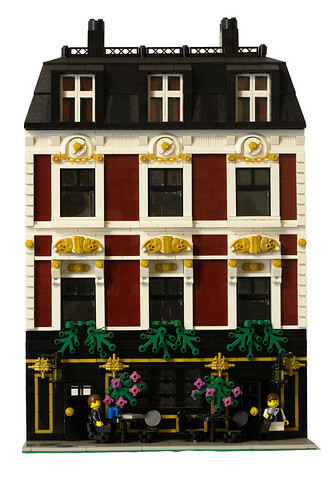 Brick Town Talk: Going for Gold - LEGO Town, Architecture, Building Tips, Inspiration Ideas, and more! London, England - (BTT) The Olympics have come and gone, so Londoners once again can return to their local pubs without being outnumbered by a flock of tourists. Occupying the ground floor of this gorgeous Georgian townhouse is the Sherlock Holmes Pub, named for a character that has seen quite a spike in popularity as of late. The gold trim along the entry facade as well as the golden accents on the floors above give this place a certain touch of class lacking in most buildings - not to mention the fact it compliments so many of the medals handed out to the great people of Britain these past weeks.